Three weeks ago we premiered a video for a new song by a Belgian band named Hemelbestormer that drew a tremendously positive response. But as good as “After Us, The Flood” is, the experience of listening to that song along with the other three on the album is even more immense. 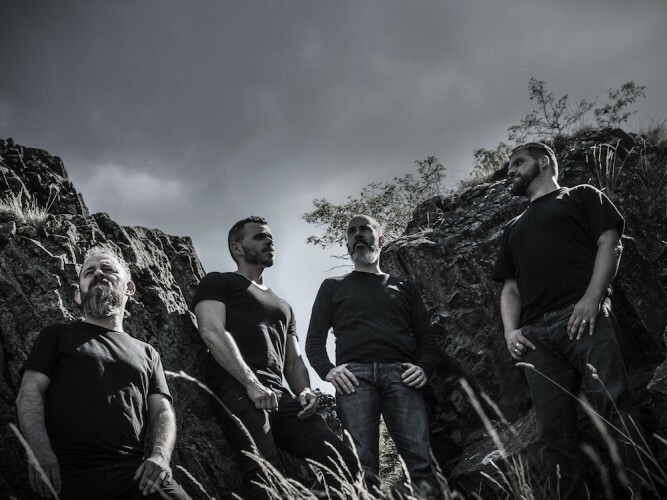 And now you will have the chance to do that: Aether is being released today by Debemur Morti Prductions, and we are bringing you a full stream of the album. As we explained at the time of that earlier premiere, “Hemelbestormer” is a Dutch word that in its literal English translation means “sky stormer” or “stormer of heaven”, but is also a name for someone with revolutionary views — an idealist, a maker of wild plans. In both senses of the word, it suits the music on Aether. I’ll go out on a limb, since the new year is only seven weeks old, and say that you probably won’t hear a heavier album in 2016 than Aether. The sound is stupefyingly titanic. The crackling, distorted guitar tone alone is overpowering, with abrasive riffs that hit with skull-cracking, spine-splintering force. The drums sound like gunshots and cannon blasts (the drumming, by the way, is fantastic). The bass notes are pavement-fracturing. The music as a whole is unrelentingly dark, dramatic, and desolate, with eerie melodies that spawn images of phantasms or vistas of glowing nebulae in the void. At times, the torrent of sound is so overpowering and densely teextured that you may feel as if you’ve been caught in the middle of a war fought on an enormous scale by formless beings so vast and powerful as to make you feel like an ant among stampeding elephants. Save for the album’s final minutes, which are laced with the distorted, blood-freezing sound of demonic whispers, mutterings, and growls, this is an instrumental album. You may wonder how an hour’s worth of almost entirely instrumental music could hold you firmly in its grip through songs that last 12, 15, or even 19 minutes. But you wouldn’t lose interest if you were being enveloped by the blast front of a hurricane, while your home was being shaken to pieces by an earthquake at the same time, no matter how long the experience lasted. As you might expect from songs of this length, the band do make use of repetition. But they seem to have an endless supply of transfixing musical motifs, and they never let any one of them last for too long before transitioning to the next one. It would go too far to say that there are any moments on the album that are genuinely tranquil, but there are still gradations of force and intensity — moments of droning, ambient sound, or subsidences when the torrential volume falls briefly to isolated guitar notes or even a short silence, before you’re crushed by another harrowing cyclone of sound. Especially during the album’s first track, there are even moments of ethereal, cosmic beauty. As ominous and destructive as the music can become, the band are also adept at hitting compulsive grooves and salting the music with hooky, pulsating riffs. But even more frequently, the music is disorienting, alien, and spectral, in addition to being cataclysmic, thanks to the rise and fall of dissonant, unnerving guitar leads that are alternately skittering, squalling, or hallucinatory. I’m sure I’ve gone overboard with the metaphors, but that’s the effect of this music. I’m afraid that trying to describe it without invoking the imagery and sensations it spawns in the mind wouldn’t do it justice. I’m probably still not doing it justice — but fortunately you can just listen to all of it right now. And my advice is to set aside an hour and go in for the full, uninterrupted immersion. 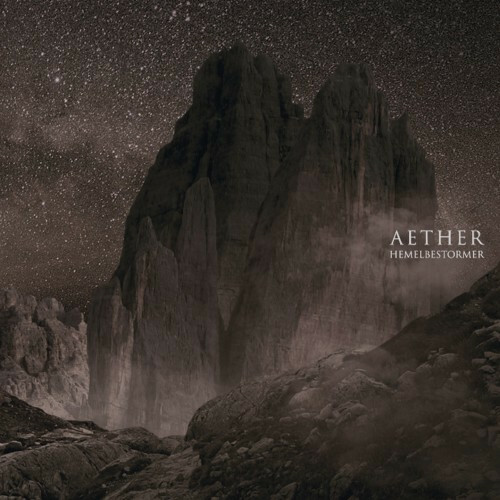 Aether is a towering achievement, an immensely powerful melding of sludge, doom, and post-metal that’s a feast for the senses and one of the year’s best new creations. Aether will be released on February 19. It was recorded and mixed by Lander Cluyse at Hearse Studio and mastered by Brad Boatright at Audiosiege, with artwork by Kevin Hensels. To order the album, go HERE or HERE (on Bandcamp). If this doesn’t break into a few end of year lists (possibly mine) I’ll be very surprised. This is like a better Omega Massif. And I really like Omega Massif. Thanks for this. There’s a name I’ve heard before, but I’ve never checked out any music. Seems like I should now…. I could have sworn I head about Omega Massif from this site, but I just searched and there’s no mention of them here. Now I have no idea where I found out about them from. But, yeah, definitely check them out. I was actually going to message this band to you guys but just saw the review, adoring this album front to back. Amazing stuff. Thanks for thinking of us — as Andy said above, this really does have “year end lists” written all over it. Likely to have real staying power. This is certainly one hell of an entrancing journey. Sign me up.